Hello! 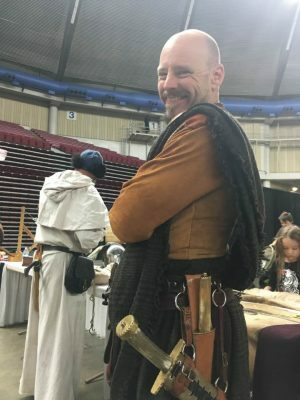 My name is Tim Louk and I work out of Fa’el’s Forge located in the foothills of the Eastern Cascades in Central Washington. Over the last several years my experiences with blade/black smithing have taken many twists and turns. What began as a young man’s simple obsession with sharpened pieces of metal has developed into not only a unique art form, but also somewhere along its convoluted path it evolved into a means in which my heart, mind and body can refocus and re-center. This ability to refocus has given me the opportunity to develop my skill set from simple stock removal blades of years past, to the forged pieces I create today. I believe this is visible in the quality craftsmanship and feel of each piece of product that I craft. Every aspect of each blades creation is done myself. From the initial forging and shaping to the fit and finish of every guard, bolster, pommel and grip. Whether they be mono-steel blades from bar stock, laminated Damascus, San Mai, or canister Damascus, every blade is made by my hands alone. I do primarily fixed blades of all sorts and sizes. Classic hunter and skinner patterns, bowies of all sorts and sizes, daggers, tomahawks, and axes for those folks who crave modern with a touch of the past. For those who truly love to delve more deeply into history, I take my greatest pleasure in reproducing historical pieces from all eras be it the Celts and Romans, Vikings and Saxons, to the North and South of our own Great Nations Civil War and everything in between. My blades are designed with their everyday use as the basis of creation. Nothing pleases me more than knowing my blades are going to be put to use. With that in mind I design them to be comfortable in the hand and shaped in a manner that encourages their proper use. After all, if it doesn’t feel right are you going to employ it to its fullest capacity? While I truly am a “form follows function” blade smith, I see no reason that a blade can’t be beautiful as well. I offer many choices of materials for blade stock from tried and true 5160 Spring steel and 1095HC to Cable Damascus as well as laminated Damascus in varied patterns. Most guards and other furniture work are scrolled brass, but other options are also available. Grips and handles are available in antler, bone, and various hardwoods. Other substances such as micarta can be utilized as well but I generally order those materials on a case by case basis. Each blade I create will be shipped with a sheath/scabbard as well, unless of course you inform me otherwise. These I also craft from start to finish. Basic patterns and material are simple top grain heavy leather with minimal tool work. However that can also be changed upon request to something more ornate. The leather scabbard can be tooled, or if you choose I can even build wooden scabbards depending on your preference. Of course these may increase in price as materials and the amount of decoration increase. While I am constantly trying to create non custom pieces to sell both on this site and at public events I really enjoy nothing more than getting together with an individual to share ideas and possibilities in an effort to create that truly custom piece that they have been yearning and searching for.